The IMA Slicker Bib is a product we make in our factory. We spent considerable time researching and testing a variety of fabrics, manufactured both domestically and abroad, before we finally were satisfied. 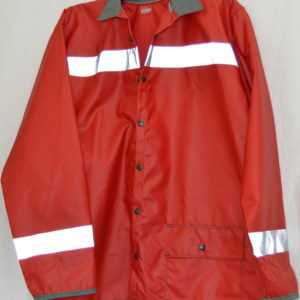 Our products are water resistant and have proven to keep the miner dry without being water repellent. If they get dirty, simply hose them off, they are extremely durable. For the Bibs and Pants, we make them with an adjustable leg length. We sew three hems on the legs so you can cut them at your desired length and the hem keeps them from tearing.